When it comes to the sports industry, analytics constitute a major component for improvisation. Hence, an understanding about the role of an analyst is vital. Sports analysts help in facilitating decision making since they are responsible in devising strategies & plans for athletes training, coaching, evaluate talent and fan engagement using the right data. On the global front analysts are highly valued and turn out to be one of the most crucial human resources for sports management. 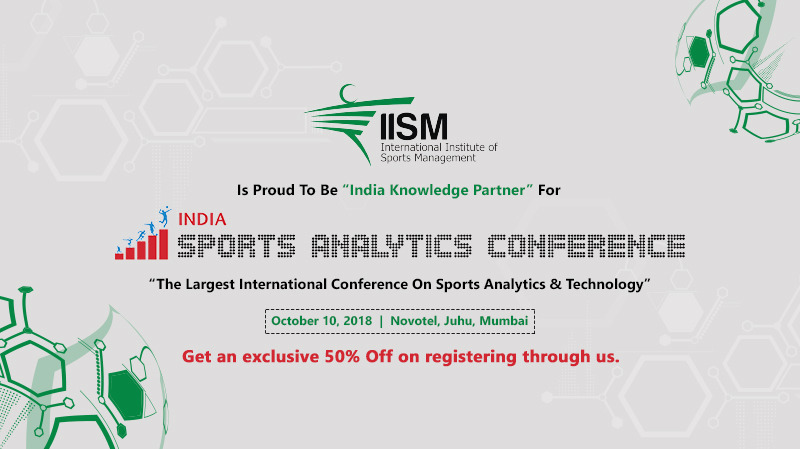 Being the premier forum for industry professionals and executives interested in the role of data and analytics in the Indian and global sports industry, the event will witness over 400 delegates from across the fields of sports, analytics, marketing, technology and more! The attendees shall include professionals across the plethora of fields such as marketing, technology sports, analytics and many more. The event shall be graced by presence of the eminent speakers such as Deep Mukherjee (head of sports development at Star India), Paul Gastin (Professor and Head, Sport and Exercise Science at La Trobe University), Sid Kohli (Assistant Producer – Sports News @BBC), Nilesh Kulkarni (Founder & Director of IISM), Laure Malone (Chief Executive Officer @ Vald Performance) and multitude of such excellent personalities who are taking the sports culture ahead globally. It’s an anbsolute honour to sponsor participation for 50 IISM students & expose them to the global norms. Not only that, but IISM has extended its support by offering a 50% waiver for all delegates registering through us. The conference facilitates learning from the technical experts, practitioners, hottest startups and corporate innovation in sports, data, IoT and wearables. Certainly, the must-attend event for those who are fueled with a passion for Sports, Media, Entertainment, Health, Technology and Business.